Made from organic menthol crystals, ICE from Vudor will catapult your taste buds to another level of frozen with this fantastically refreshing menthol E Liquid. This Juice is a real palate cleanser and has an icy kick unmatched by any other. You will not find a better menthol anywhere. 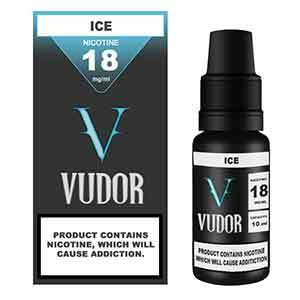 Vudor ICE is the best menthol e liquid in the world. Yes we are that confident. I will go as far as saying this menthol flavour is impossible to beat. It is a very powerful pure menthol taste with absulutely zero artificial taste at all. It would most likely cure a cold its that good. I can't believe how smooth it is but ice cold. Unbeatable 6 stars. Glad your'e loving the ICE Daz, it really is as good as you say. it's all down to the organic menthol crystals used and the grade of nicotine which gives it that smoothness. They use the highest grade of nicotine in the world.